Note: Want to dress like Buffy or anyone else from a particular episode (like Buffy in her “Prophecy Girl” dress)? See our resource on Buffy dresses, clothes, and outfits. When Buffy met her first vampire in Sunnydale in the first episode of Season One, her first words to him were, “And what’s with that outfit? You look like DeBarge!” And from that time on, we would always know — and see — that she would always have great outfits. Today, fans of the show still follow, well, suit. 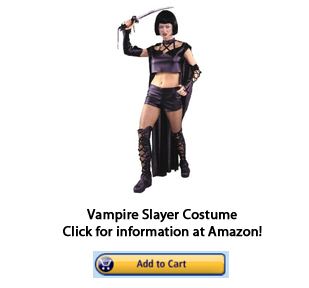 Whether you are looking for a “Buffy” costume to dress as a vampire slayer for Halloween (or any other time of year! ), we have gathered all of the costumes, hoodies, sweatshirts, and more that every “Buffy” fanatic can wear to sport their slayer pride. While the actual outfits worn by the actresses on the show have long since been sold to collectors at auctions after “Buffy the Vampire Slayer” ended, there are still numerous items of “Buffy” clothing that can be purchased to this day. 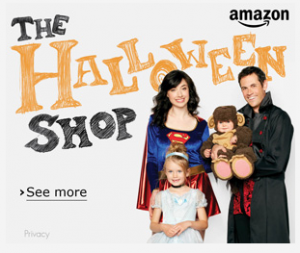 We’ve taken the time to list everything that we could find below, but the number of “Buffy” costumes and clothing that is available is enormous. (We have “Buffy” T-shirts and dresses, clothes, and outfits on entirely-separate pages on BTVS Online because there are simply so many that it would make this page extremely large and long.) Still, if you know of any other items that are available, please be sure to let us know — our goal is to list everything that is able to be purchased in order to be a great resource for “Buffy” fans who, like us, still love the show years later. Which Buffy Costume Do You Want?